PLT is a great organization with wonderful programs. You should schedule them to come to your school and reap the benefits of their knowledge, wisdom, and resources. I hope this article taken from PLT encourages you to teach outside every opportunity you have. After all, it is our home, and kids love to be outdoors. Quick—what’s your favorite Project Learning Tree activity? Now think again. Where do you do it? If you answered “indoors,” reflect… could you have done it outdoors? Even reading a story, like “In the Forest of S.T. Shrew” found in PLT’s Activity Guide8, takes on many added dimensions, if simply read outdoors. We teach indoors for lots of reasons. After all, someone built us a building. Indoors feels secure. There are four walls and a ceiling. It never rains, snows, or darkens, and it’s always a comfortable temperature. We have desks, pencils, Smart Boards, and electrical outlets. However, it can deprive us of stimulation. With benefits like these, teaching outside should be a “no-brainer.” Yet most teachers don’t go outside with their students. Why? Sixty-six percent (23 teachers) never used the pond area; 37% (13 teachers) never used the pine forest; and 40% (14 teachers) never used the wetland. Most used the outdoor areas 1-5 times a year. Only one teacher used it 6-10 times a year. Only the K-2 teachers cited “supervision of children” and “natural hazards” as barriers. Only grade 3-5 teachers cited “lack of knowledge.” Teachers from all grade levels cited the curriculum standards and the daily schedule. the teachers simply don’t like nature/cold/wet/wind/sun/snow/ticks/etc. Attend a PLT workshop and become comfortable teaching outdoors – in urban, suburban, and rural environments. I know which teachers consistently take their students outside to learn, and have heard testimonials on the benefits of nature in academic settings. Find a mentor at a local nature center, through your state environmental education organization, or contact your state PLT program coordinator for help. Check out the many useful Appendices in PLT’s Envrironmental Experiences for Early Childhood guide, for example “Playing It Safe Outdoors”, “Taking Neighborhood Walks”, “Setting Up an Outdoor Classroom”, “Encouraging Unstructured Outdoor Play”, and more. 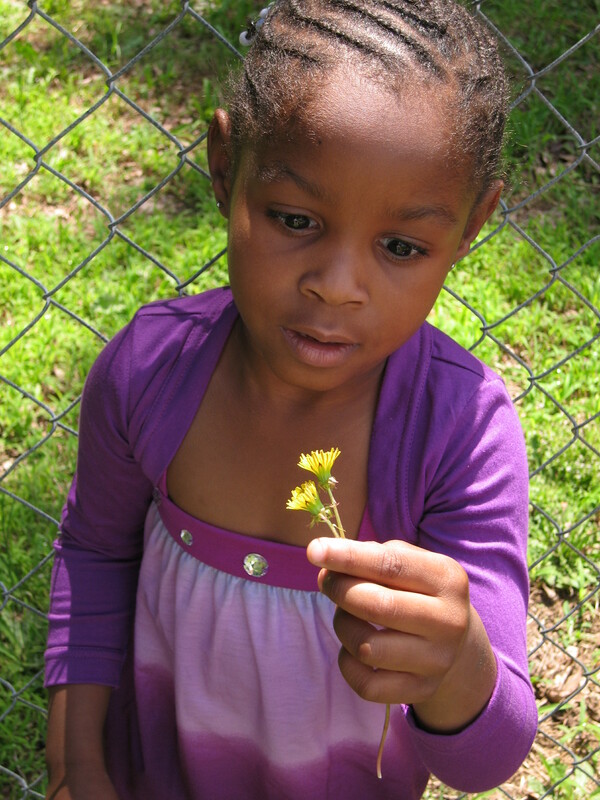 Gardening reclaims the heart in nature education! Gardening with children is active learning, and gardens are a place where the cycle of life and season’s come alive for kids. An outdoor classroom promotes social interaction and communion with nature. And they can bridge age gaps by bringing together family and community members who are generations apart. They are a place of spontaneous hands-on discovery that can not occur sitting at a desk or reading a book. Young children not only strengthen fine and gross motor skills, but experience their own impact on their environment. They hone in their observation skills and develop a scientific understanding as early as preschool years as they watch plants change and grow. Gardening is a way to learn the consequences of one’s actions in a very direct way. Watching a seedling unfurl, witnessing the death of a neglected plant, raising a garden for butterflies — such experiences help students acquire a direct, personal understanding of what living things require to thrive, and how they adapt and interact. These connections serve as a vital foundation for developing a lifelong ethic of environmental stewardship. Children learn about conservation and recycling, and develop skills they can use for the rest of their lives. The garden shows the children’s strength, ability, and love for the outdoors and nature. Gardening with kids gives them “a real-life connection to what they learn in the classroom and develops deep roots for lifelong learners. Develop a curriculum that improves communication skills, increases their knowledge and understanding of each other, promotes peace, and brings about healthy changes in their lives, community, and the world. 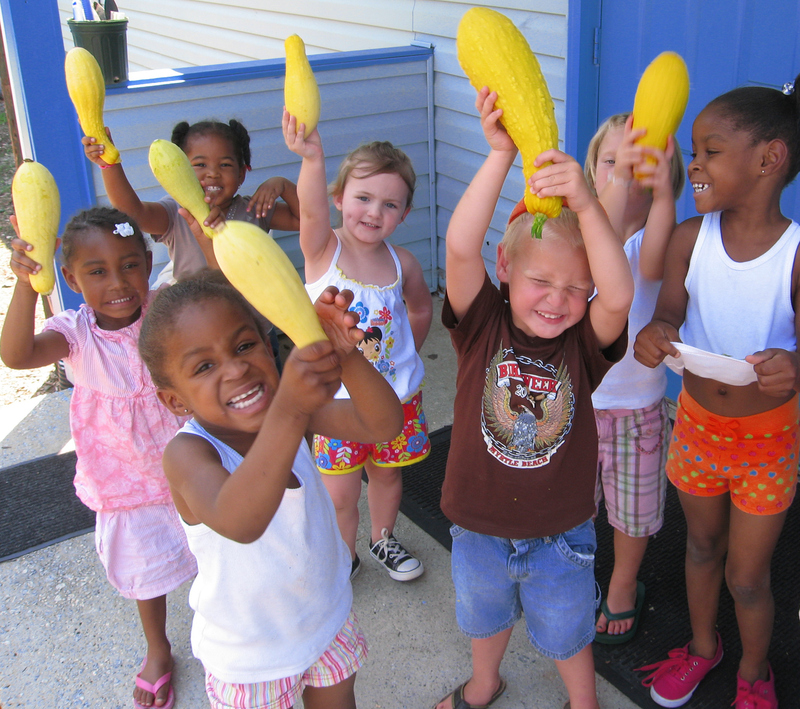 Sound nutrition and physical activity are one of the most important parts of a child’s health and development. We are nature’s guest. The leader of a good outdoor classroom or study group must posses the ability to arouse curiosity and enthusiasm and share a genuine love for nature. Every situation should reflect the teachers environmental ethics.Our values reveal the relative importance of the human to other organisms. To establish values for the environment we need to observe and understand it. Environmental values will inevitably become more and more critical as population growth, the lack of clean air and water, climate change, resource depletion and poverty grow. And the mare’s foal and the cow’s calf. Learning is taking place at all times in all circumstances for every person. There are many ways to learn. Children learn best by doing. Inspire children with the diversity of life! Biophilia is the love of nature. Eco-psychology and evolutionary psychology suggest that humans are genetically programmed by evolution with an affinity for the natural outdoors. 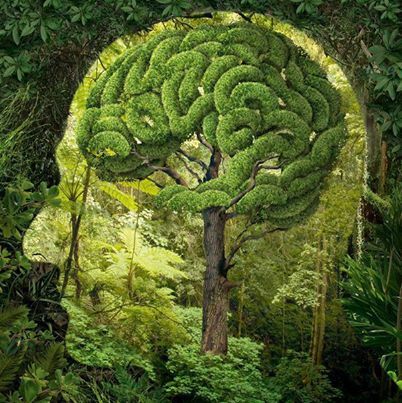 Evolutionary psychologists use the term biophilia to refer to this innate, hereditary emotional attraction of humans to nature and other living organisms. Natural outdoor environments produce positive physiological and psychological responses in humans, including reduced stress and a general feeling of wellbeing. People, especially young children, who have not yet adapted to the man-made world, prefer natural landscapes to built environments. Biophobia is the aversion to nature. If the human attraction to nature is not given opportunities to flourish during the early years of life, biophobia may develop. Biophobia ranges from discomfort in natural places to active scorn for whatever is not man-made managed or air-conditioned. Biophobia manifests in the tendency to regard nature as nothing more than a disposable resource. Research consistently shows that children have a strong preference to be outdoors in nature. Nature sustains us and is an incredible library of knowledge. Children are natural explorers and have an intense desire for knowledge about their surroundings. They need opportunities to explore the natural world for if there are not early experiences with nature, a love and respect for nature doesn’t develop. It is important that we guide children to discover themselves and the world around them. In the outdoor classroom children feel a sense of belonging in nature, become more observant, and develop a reverence for life. Watching a seedling unfurl, witnessing the death of a neglected plant, raising a garden for butterflies – these experiences help students acquire a direct, personal understanding of what living things require to thrive, and how they adapt and interact. These connections serve as a vital foundation for developing a lifelong ethic of environmental stewardship. The outdoors is a developmentally appropriate classroom for children. Society puts its best foot forward in early childhood education. Fifty percent of our intellectual capability is achieved before the age of four. Psychological patterns are set before the age of seven and the child’s self image is formed during this time, which sets his personality pattern. I can’t think of any better place to stimulate their senses and develop perceptual motor skills than the great outdoors! Children are not born with finely tuned perceptual motor skills. They are a result of being challenged as a child. Research has shown us the intellectualizing capability of the senses. The development of the senses precedes that of superior intellectual activity and the power of observation is procured through the development of the senses. Children are sensorial explorers. They gain a better understanding of the world around them when they are involved in activities that bring them in direct contact with nature. Nature captivates the child’s imagination, activates the senses and gives them a sense of belonging in nature and they develop the ability to express their experiences. Knowledge advances rapidly when the line between work and play fades. Remember . . . children are always unconsciously taking in impressions that form their minds. Conduct some observation excursions. Walk with a purpose. Maybe it will be to discover trees, the kinds of leaves or fruit they bear, the shade they give, or the shelter they give to birds and animals. 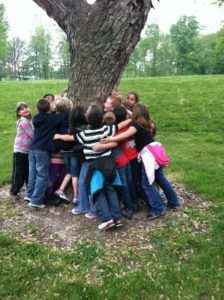 You can teach children about trees in the classroom, but they must see and experience trees to make trees real to them. Get outside with children, get some exercise, build a garden and explore together. Everyone benefits! Rather than showing them a tomato, let them grow one and see where it comes from, and how and what it needs! Our children will grow healthier, understand where their food comes from and that plants are alive, and an outdoor classroom addresses our health in every way . . . mentally, physically, and spiritually. It is a fact. It is our responsibility to see that our children get what they need in the healthiest environment possible. It is a critical time to stand up for children and provide them with more than a swing and monkey bars and a yard of fire ants or a basketball. I know this is not every school, but I have seen and experienced enough to know that our children’s greatest needs and period of learning and development are from conception through the elementary years. This is where our focus should be in order to help children grow healthy and strong. After these years there focus changes, there ‘s a social adjustment, a different focus, and very different life experiences. Environmental education should start early with hands-on experiences with nature. There is evidence that concern for the environment is based on affection for nature that only develops with autonomous, unmediated contact with nature. The way people feel in pleasing natural environments improves recall of information, creative problem solving, and creativity. Early experiences with the natural world have been positively linked with the development of imagination and a sense of wonder. Wonder is important as it a motivator for life long learning. The natural world is essential to the emotional health of children. Just as children need positive adult contact and a sense of connection to the wider human community, they need positive contact with nature and the chance for solitude and the sense of wonder that nature offers. All the manufactured equipment and indoor instructional materials produced by the best educators in the world cannot substitute for the primary experience of hands-on engagement with nature. Manufactured equipment falls very short of the potential of outdoor areas to be rich play and learning environments for children, and denies children their birthright to experience nature outdoors, which includes vegetation, animals, insects, water and sand, not just the sun and air that manufactured playgrounds offer. The lives of children today are more structured and supervised, with few opportunities for free play. Their physical boundaries have shrunk. Parents are afraid for their children’s safety And when children do have free time, it’s often spent inside in front of the television or computers. For some children, that’s because their neighborhood, apartment complex or house has no outdoor play space. Children live, what one play authority refers to, a childhood of imprisonment. Childcare facility playgrounds are often the only outdoor time many young children experience. Gardening reclains the heart in nature education!